On a map of Michigan, you can see that the State is bounded by Lake Michigan and Wisconsin on the west. It is bordered by Lake Huron and the Canadian Province of Ontario on the northeast, and by Ohio on the southeast. Lake Superior lies to Michigan's northwest and the State of Indiana lies to its southwest. Michigan is the 22nd largest state in the United States, and its land area is 56,804 square miles (147,122 square kilometers). The State of Michigan is divided into 83 counties. This Michigan map site features road maps, topographical maps, and relief maps of Michigan. The detailed, scrollable road map displays Michigan counties, cities, and towns as well as Interstate, U.S., and Michigan state highways. The pannable, scalable Michigan street map can be zoomed in to show local streets and detailed imagery. to view a scalable Michigan road map. The detailed Michigan map and the regional Michigan map display cities, roads, rivers, and lakes as well as terrain features. The detailed map shows only the State of Michigan, while the regional map shows Michigan and the surrounding region. Michigan's capital city is Lansing. Other major cities found on the Michigan map include Detroit, Grand Rapids, Warren, Sterling Heights, Flint, Ann Arbor, Livonia and Dearborn. In 2005, the population of Michigan was estimated at 10,100,833, which is about 178.2 people per square mile. In 2010, Michigan's population declined to 9,883,640 people. The state's Interstate Highways include I-69, I-75, I-94, and I-96, as well as auxiliary routes I-196, I-275, I-496, and I-696. The name Michigan is derived from the Native American word "michigana", which means "great lake". Michigan consists of the Upper Peninsula and the Lower Peninsula, which are joined by a bridge over the Straits of Mackinac. The Lower Peninsula is more densely populated than the Upper Peninsula, and features sandy beaches on its western, Lake Michigan shoreline. The Upper Peninsula's terrain varies from swampland in the northeast, near Lake Superior, to low mountains in the west. Michigan's lakes and the natural scenery of Mackinac Island, Isle Royale National Park in Lake Superior, and Pictured Rocks National Lakeshore attract visitors each summer. For additional Michigan travel and tourism information, visit the official Michigan tourism site and Michigan Atlas. This online Michigan reference map shows major cities, roads, railroads, and physical features in Michigan. 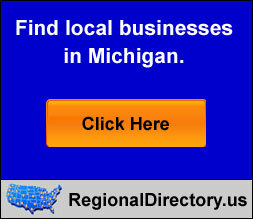 Several map publishing companies offer printed maps of Michigan. For example, Omni Resources offers several maps of Michigan that feature points of interest, airports, and parks, as well as selected local attractions and insets of major Michigan cities. Michigan-Map.org Editor, State Maps, PO Box 775, Barnegat, NJ 08005.